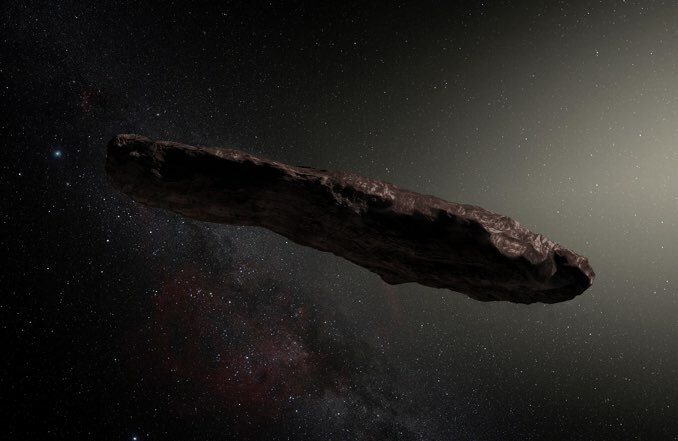 The strange, cigar-shaped interstellar asteroid ‘Oumuamua, discovered racing through Earth’s solar system last October at a blistering 30 kilometres per second (67,100 mph), likely originated in a binary star system. Astronomers testing how efficiently binary systems can eject bodies through gravitational interactions found that rocky objects like ‘Oumuamua are much more likely to originate in binary systems and that ejected rocky bodies should be just as common as brighter, easier-to-spot icy comets. “It’s really odd that the first object we would see from outside our system would be an asteroid, because a comet would be a lot easier to spot and the solar system ejects many more comets than asteroids,” said Alan Jackson, a postdoc at the Centre for Planetary Sciences at the University of Toronto Scarborough in Ontario, Canada. Jackson and co-workers suggest ‘Oumuamua likely was ejected early in the star system’s development, during the era of planetary formation. ‘Oumuamua generated widespread interest after its discovery by the Haleakala Observatory in Hawaii on 19 October 2017. It was the first interstellar asteroid ever discovered. At that time, the asteroid was some 33 million kilometres (20.5 million miles) from Earth and heading out of the solar system after making its closest approach to the sun 40 days earlier. Researchers initially thought the object was a comet, but observations showed ‘Oumuamua, measuring about 230 metres long by 35 metres wide (800 feet by 100 feet), was a dense, rocky body that was tumbling chaotically. 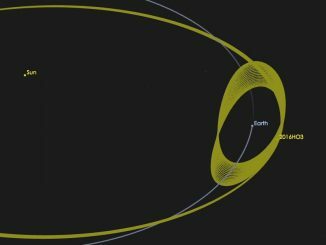 Analysis of its trajectory and high velocity indicated it originated outside Earth’s solar system and would not be captured by the Sun’s gravity. Jackson and his colleagues, after determining binary star systems are very efficient ejectors of rocky bodies, concluded ‘Oumuamua most likely originated in a binary system with a relatively massive component because such systems could be expected to have a larger number of asteroid-like bodies in close orbits. A study describing the results is published in the journal Monthly Notices of the Royal Astronomical Society. A new analysis of 13 supernovae — including archived data from NASA’s Hubble Space Telescope — is helping astronomers explain how some young stars exploded sooner than expected, hurling them to a lonely place far from their host galaxies. 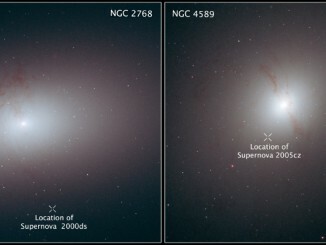 It’s a complicated mystery of double-star systems, merging galaxies, and twin black holes. The Chelyabinsk event two years ago heightened public awareness of the threat posed to humanity by an asteroid strike, but what can be done to prevent it happening again? 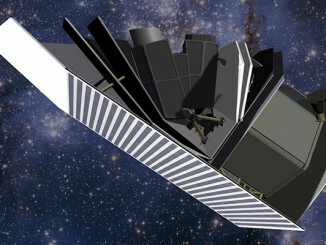 The forthcoming Sentinel Space Telescope and ATLAS Project will hopefully prevent us being caught off guard.